Inquiring minds are noting the expected (at least in this corner) collapse in European retail sales as measured by PMI indices. The spotlight for this post is France, the second largest Eurozone economy following Germany.The Markit France Retail PMI® shows French retail sales fall for ninth consecutive month. French retailers reported another month-on-month decline in sales during December – the ninth in succession which is a survey record. Sales were also down on an annual basis, and fell well short of retailers’ plans. Gross margins remained under considerable pressure, partly reflecting a strong and accelerated rise in purchasing costs. The headline Retail PMI® slipped to 46.8 in December, from 48.8 in November. The latest reading was indicative of a solid rate of contraction. Anecdotal evidence suggested that a difficult economic climate and low customer footfall had contributed to the drop in sales. Actual sales at French retailers once again disappointed relative to previously set plans in December. The degree of undershoot was the greatest since August. Survey respondents are also pessimistic regarding the one-month outlook for sales. Factors expected by retailers to boost sales over the coming three months include cold weather, new product launches and promotions. Those factors expected to depress sales include a weak economy, depressed consumer confidence and increased taxes. Latest data indicated that French retailers’ gross margins remained under strong pressure in December. 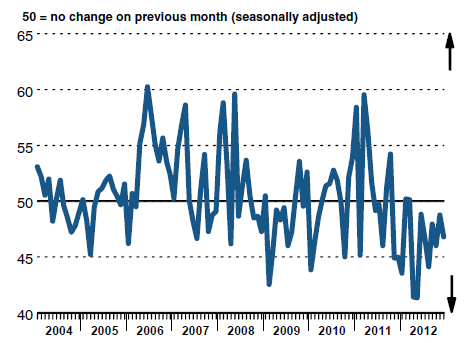 Margins have declined in every month since February 2008. Wholesale prices faced by French retailers continued to increase in December. The rate of inflation accelerated to the sharpest since February. Panellists reported that suppliers had generally raised prices in order to pass on higher raw material costs. Retail sales in France fell for the 9th consecutive month, a new record. Deterioration is marked as well as expected. Because of the sharp rise in inflation, things are even worse than they look at first glance of the PMI numbers. The horrendous policies from president Francois Hollande and his socialist cronies including ridiculous tax hikes and inane rules on firing workers are going to cause massive heartburn (to put things mildly). Given that any clear-thinking person should quickly realize that if companies cannot fire workers they will be extremely reluctant to hire them in the first place , it should be no surprise to discover French Unemployment Highest in 14 Years (And It’s Going to Get Much Worse). In France, Government spending amounts to 55% of total domestic output. For discussion, please see Hollande’s Honeymoon is Over; 54% of Voters Unhappy; Unions Promise “War” in September. Looking ahead to 2013, I Expect things in France to get worse at an accelerated pace.